When Walt Disney was building his Disneyland empire in California in 1955, there was a growing fascination with all things Disney in post-war Europe, and particularly in Italy. Topolino, or Mickey Mouse, hit it big in Italy. By the 1960’s, a lively series of paperback bound comics emerged and were extremely popular. The comics paralleled a fascination with American culture that was taking hold. Today, tees and sweatshirts and all manner of clothing are festooned with Topolino imagery, and a good number of grown men and women don this attire enthusiastically. In Italy, Disney is not just for kids. I have a large collection of the Italian Disney comics, and I never fail to return from Italy without at least 3 or 4 new issues. I am addicted. 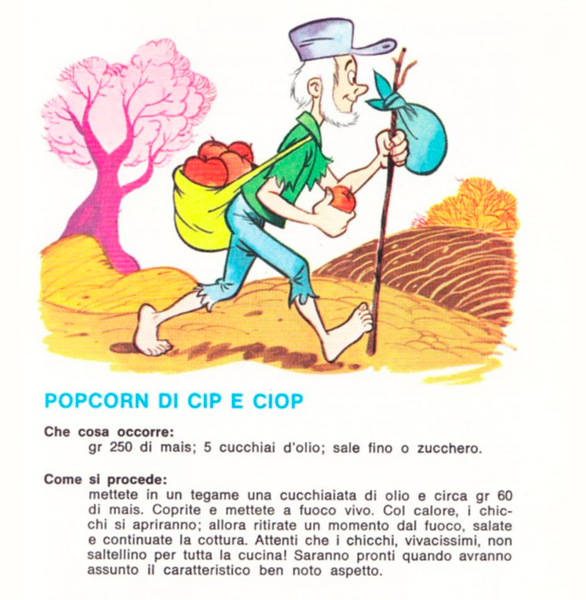 I learned a lot of my Italian and a multitude of colorful idioms from these illustrated books. 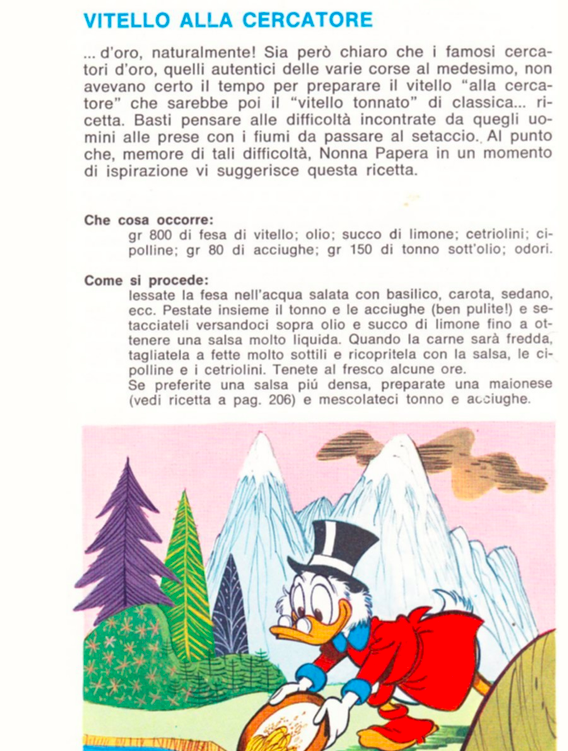 And it turns out that many Italians learned a lot about “American” cooking from their Disney-Italian comic book characters. 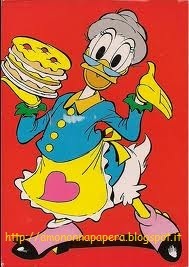 You can thank Donald Duck and his extended family. A favorite series featured the adventurous tales of Uncle Scrooge McDuck (Paperone) along with nephew Donald (Papernik) his three nephews (Qui, Quo, and Qua) and Grandmother Elvira known as Nonna Papera (Grandma Duck). A rather distorted image of American family life was presented in these comics. 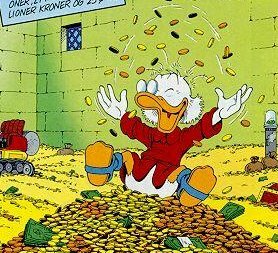 Picnics in the park, gold mining in the Rockies, cowboys wrangling cattle in the west, river rafting down the Mississippi, and trips to outer space were family adventure stories in the comics, all bankrolled by Unca Scrooge himself and in pursuit of some thief who was stealing his treasure chest. Thank goodness for Nonna Papera. She kept the boys well-fed, the American way. The Italian comic book artists delighted in depicting her beautiful apple pies cooling on her window sill, and even several adventures involved mysteries around who swiped the cooling pastry. Italians became fascinated with Nona Papera’s beautifully fluted pies– and her cookies, sandwiches, and picnic fare, too. 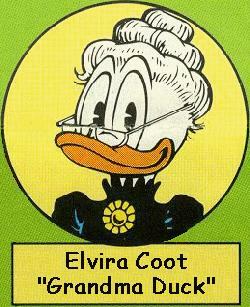 According to Barks’ and Rosa’s Who’s Who In Duckburg, “Grandma Duck is in many ways the head of the Duck-family. She is normally the one who arranges the family’s Christmas celebrations and she’s known as an excellent cook with pies as one of many specialities.” It was Donald’s grandmother who made American pie popular in Italy. 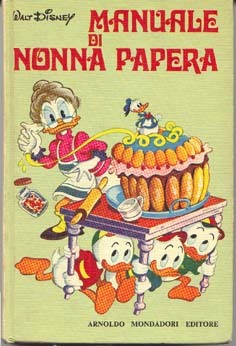 By 1970, a book of her recipes was published under the title Il Manuale di Nonna Papera (The Cookbook of Grandma Duck). Many Italian cooks will tell you today that this collection of recipes was their first cookbook and first venture into cooking. Most of the recipes are an Italian interpretation of American dishes, but in reality, the recipes remain Italian in spirit. 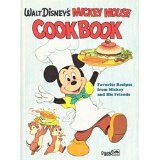 Sandwiches (or panini), a Chip and Dale Popcorn recipe, and lots of cakes and pies are included and are featured alongside traditional Italian sweets, finger foods, and several main dishes. Cleverly named, many recipe titles indicate that these are historical recipes handed down to Nonna Papera from very famous people of the past such as Queen Elizabeth or Christopher Columbus (appropriate personages for the settlement of America). 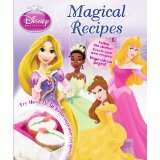 NOTE: Click on the sidebar menu under Recipes for more cooking with Disney! I love this apple cake, I made it for the first time many years ago and then I lost the recipe, so glad I found it again. 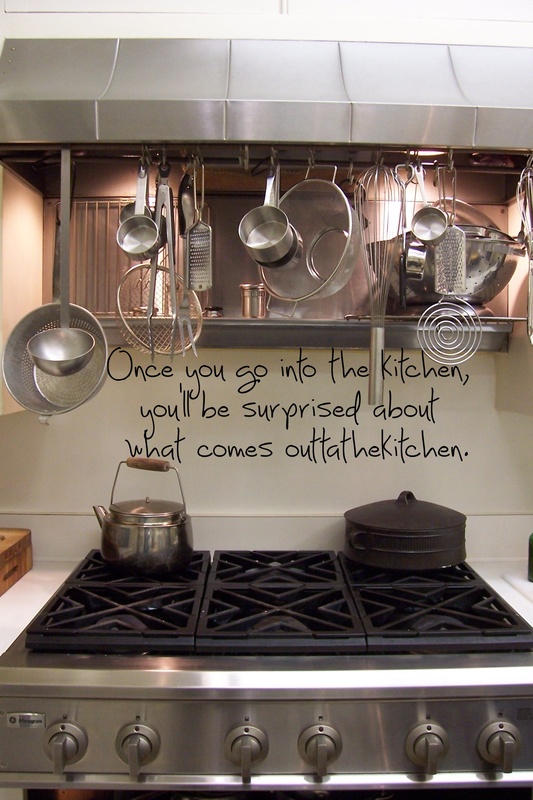 So pleased to learn that outtathekitchen played a role in helping you rediscover a favorite old recipe. Stop by OTK in the near future.